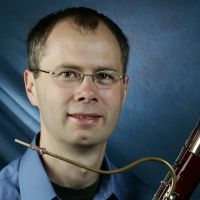 Additional Info: Doug Spaniol is a Professor of Music and Coordinator of Woodwinds in the School of Music at Butler University's Jordan College of Fine Arts, where he teaches bassoon and courses in reed-making, pedagogy, theory, and chamber music. In the summers, he serves as instructor of bassoon at the world-renowned Interlochen Arts Camp . He was previously a member of the faculty at Valdosta State University and has twice served as visiting professor at The Ohio State University. A leading bassoon pedagogue, Dr. Spaniol is the author of the New Weissenborn Method for Bassoon (Click on Photos tab for more info.) published by Hal Leonard and an Artist/Clinician for Yamaha Corporation. His dedication and effectiveness as a teacher are reflected in the many accomplishments of his students. These include winning competitions leading to concerto performances with the Indianapolis Symphony Orchestra, the Kokomo Symphony Orchestra, the Kokomo Park Band, the Butler Symphony Orchestra, and Interlochen's World Youth Symphony Orchestra. In addition, his students have been offered scholarships and graduate assistantships to this country's finest music schools, and have won prizes in competitions sponsored by Pi Kappa Lambda, the Indianapolis Matinee Musicale, the American Federation of Musicians, and in the Prelude Awards Competition sponsored by the Children's Museum of Indianapolis. As a performer, Dr. Spaniol has appeared as concerto soloist with Sinfonia da Camera, the St. Petersburg Classical Symphony Orchestra, Solisti St. Petersburg, the Central Ohio Symphony Orchestra, the Philharmonic Orchestra of Indianapolis, and Butler's Symphonic Wind Ensemble and Jordan Sinfonia. He can be heard as soloist on two CDs: Bassoon with a View (Innova 520) and Frank Felice: Sidewalk Music (Capstone CPS-8707). As a member of Arbítrio (with Alicia Cordoba Tait, oboe, and Bradley Haag, piano) he has performed throughout the Midwest, in St. Petersburg, Russia, and Buenos Aires, Argentina, and recorded a CD for Centaur Records. As principal bassoonist of Sinfonia da Camera, Dr. Spaniol has toured England, been heard on NPR's Performance Today, and appears on CDs on Albany and Zephyr Records and the Classical Music for Dummies CD. He maintains an active performance schedule as recitalist, chamber musician, and in performances with the Indianapolis Symphony Orchestra, Indianapolis Chamber Orchestra, and other ensembles. He has presented masterclasses at the St. Petersburg Conservatory, Michigan State University, and for the Music for All/Bands of America National Festival, among many others. He frequently appears as a performer/presenter at conferences of the International Double Reed Society, and he served for six years as the Bassoon Chair for the IDRS's Fernand Gillet - Hugo Fox Competition. In 1992 Dr. Spaniol was named a Marshall Scholar and subsequently studied at the Royal Northern College of Music in Manchester, England, where he was awarded the prestigious postgraduate diploma in performance. He also holds degrees from the University of Illinois and from The Ohio State University. His bassoon teachers include Christopher Weait, William Waterhouse, and E. Sanford Berry. Registration is completely free and allows you to create an informative, searchable online profile at BassoonProfiles.com.